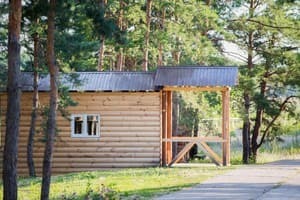 Tourist complex "Club Hotel Oskol" is located in the village of Yatskovka on the shore of the Krasnooskolsky water reservoir. The complex is located in a private closed area with 24-hour security. 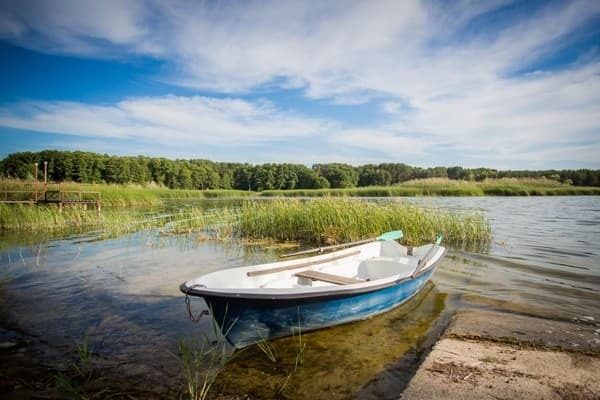 For accommodating guests, 6 luxury cottages with up to 10 guests and 2 lodges for up to 4 guests are equipped. Cottages are equipped with beds with orthopedic mattresses, fireplaces, shower cabins, TV with satellite TV. Also in the houses there is air conditioning and heating, free Wi-Fi. There is a terrace or a gazebo with a barbecue next to the house. 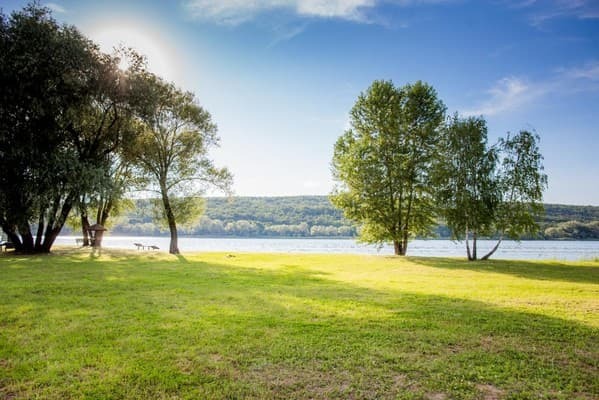 Residents can relax on a private sandy beach, go boating, quad biking, bicycles. Guests can order food delivery. For an extra charge, you can order a sauna on the wood. Free car parking is available for residents. 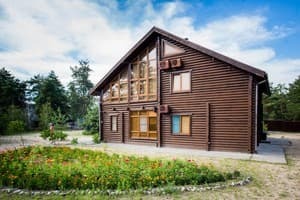 The tourist complex "Club Hotel Oskol" is located 17 km from the town of Svyatogorsk and from the National Natural Park "Holy Mountains". Description of the room: The room - a double bed (with memory foam mattresses, bedding), cupboard, clothes hanger, refrigerator, electric oven, dishes for 2 persons, microwave oven, electric kettle, TV, satellite TV. Heating - on request, to be paid extra. The bathroom is on the street - a toilet with a sink and hot water shower. At the entrance porch with a table. Barbecue. Separate wi-fi - not. Room area - 15 square meters. m. Capacity of rooms - two guests. Extra beds - do not. 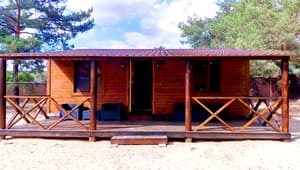 Description of the room: In the room - single beds (orthopedic mattresses, bed linen), equipped kitchen (cold water), bar table, refrigerator, electric oven, crockery for 4 persons, microwave oven, electric kettle, TV, satellite TV. Heating - no. A bathroom in the street - a toilet with a sink and a shower hot water. At the entrance there is a veranda with a table. Barbecue. Separate descent for boats. Separate wi-fi - no. The area of ​​the room is 18 square meters. m. Additional places - no. 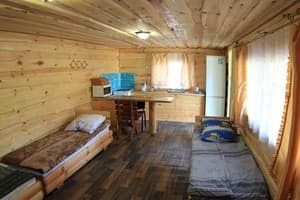 Description of the room: The cottage is rented from 2 people. In the room there are four one-and-a-half beds (armor mesh, bed linen), a washbasin (cold water), a cupboard for clothes, a clothes hanger, a fridge, an electric oven, utensils for 4 persons, a microwave oven, an electric kettle, a TV set, and satellite TV. Heating - no. A bathroom in the street - a toilet with a sink and a shower hot water. At the entrance there is a veranda with a table. Barbecue. Separate wi-fi - no. The area of ​​the room is 18 square meters. m. Additional places - no. Description of the room: First floor. Living room with equipped kitchen: dishes for 2 persons, refrigerator, microwave, electric kettle, electric cooker, one-burner, 32-inch LED TV, satellite TV. Separate bathroom and shower. Second floor. Bedroom: double bed with orthopedic mattress, bedside table, air conditioning. Terrace with dining table. 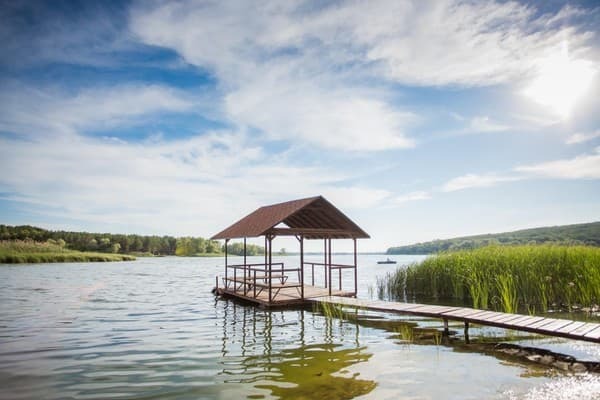 A wooden pier with access to the lake. Heating - electric convectors. Separate wi-fi - no. Room size - 50 square meters. m. Additional places - no. Description of the room: The cottage is rented from 2 people. Living room: double sofa, kitchen set, folding table, chairs, TV, satellite TV, refrigerator, microwave, electric kettle, air conditioning. Bedroom: two single beds with orthopedic mattresses, wardrobe. The bathroom is combined with a shower. Kitchen-vestibule: a sink, a cupboard for dishes, dishes for 4 persons, an electric stove. Heating - electric convectors. Terrace with gazebo and barbecue. 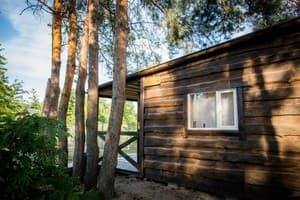 Separate wi-fi Area of ​​the cottage - 40 square meters. m. Capacity of the room - four guests. Additional places - no. Description of the room: The cottage is rented from 2 people. Living room with equipped kitchen: double sofa, kitchen set, coffee table, dishes for 8 persons, refrigerator, electric hob, microwave, electric kettle, led-TV 32 inches, satellite TV. Bedroom 1: two single beds with orthopedic mattresses, chest of drawers, two bedside tables. Bedroom 2: double bed with orthopedic mattress, wardrobe, chest of drawers, bedside table, led-TV 32 inches, satellite TV. Bedroom 3: double bed with orthopedic mattress, wardrobe, chest of drawers, bedside table, led-TV 32 inches, satellite TV. The bathroom is combined with a shower. Heating - electric convectors. At the entrance there is a veranda with a table. Barbecue. Separate wi-fi. 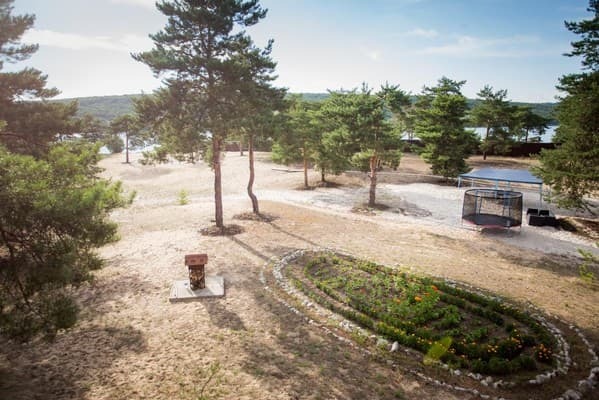 The area of ​​the cottage is 45 square meters. m. Extra beds - two, a sofa. Description of the room: The cottage is rented from 2 people. First floor. Fireplace room: a double sofa, two armchair-beds, a led-TV 37 inches, satellite TV, air conditioning, a table, a wood-burning fireplace. The bathroom is combined with a shower. Kitchen: dishes for 8 people, refrigerator, electric hob, microwave, electric kettle. Second floor. Bedroom: double sofa, double sofa, air conditioning, two chests of drawers, table, panoramic windows on the hotel grounds. Corridor with a cupboard Terrace with gazebo and barbecue. Heating - electric convectors. 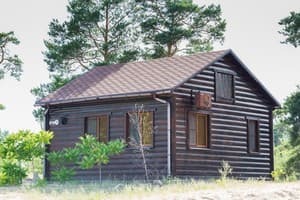 Separate wi-fi Area of ​​the cottage - 100 square meters. m. Additional places - two, a chair-bed. 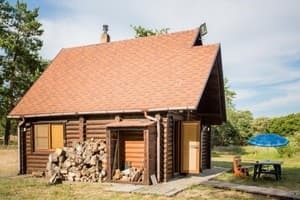 Description of the room: On the first floor of the cottage there is a fireplace room with a kitchen, a dining table for 12 people, a corner double sofa, a 52-inch led TV, satellite TV, air conditioning, a wood burning fireplace. In the kitchen there is a table for 6 people, a kitchen set with a bar counter, a refrigerator, an electric hob, a microwave oven, an electric kettle. In the bedroom there is a double bed with orthopedic mattress, 2 armchairs, a bookcase, a bedside table, a led-TV 32 inches, satellite TV, air conditioning. On the floor there is a combined bathroom with a shower cabin, a Finnish sauna. Second floor. Bedroom 2: double bed with orthopedic mattress, dressing table, wardrobe, two bedside tables, led-TV 32 inches, satellite TV, air conditioning. Balcony with a view of the hotel grounds. Bedroom 3: two single beds with orthopedic mattresses, wardrobe, two bedside tables, a led-TV 32 inches, satellite TV, air conditioning. Bedroom 4: double bed with orthopedic mattress, chest of drawers, wardrobe, bedside table, 42-inch led TV, satellite TV, air conditioning. Balcony with a view of the reservoir. On the floor: a bathroom combined with a shower. Terrace with gazebo and barbecue. Heating - electric convectors. Separate wi-fi. 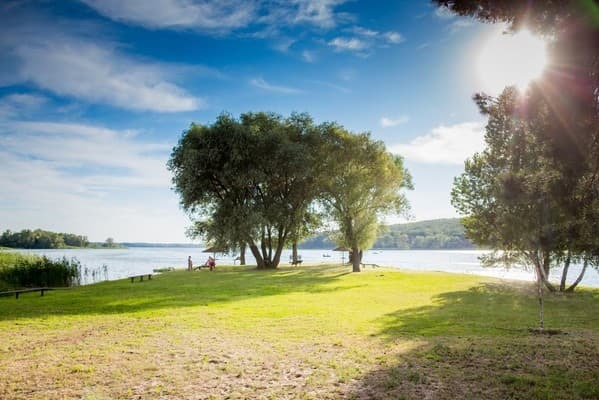 The area of ​​the cottage is 200 square meters. m.
Children under 6 years without an extra seat are free. Some cottages have the option of an extra bed (specify at the time of booking). Some cottages have a kitchen. It is possible to order delivery of products. 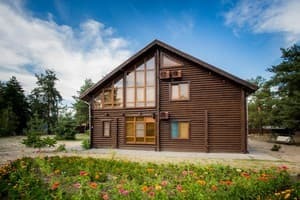 Tourist complex "Club Hotel Oskol" is located in the village of Yatskovka on the shore of the Krasnooskolsky water reservoir. 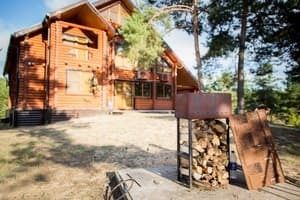 The tourist complex "Club Hotel Oskol" is located 17 km from the town of Svyatogorsk and from the National Natural Park "Holy Mountains". From Svyatogorsk, Izyum or Slavyansk you need to take the bus to Yatskovka. You can also book a transfer from the station at an agreed price.